Be A Leader And A Follower….. When I read the article I’ve captioned below, I thought to myself…. “this sounds so familiar!” And indeed it is because I have encouraged sales teams on more than one occasion (and in more than one blog) to reach out to our customers at least every quarter and in unusual ways. Mr. Millet echoes this practice, and several other ideas I have suggested over the past two years. How often do you contact your prospects/clients? 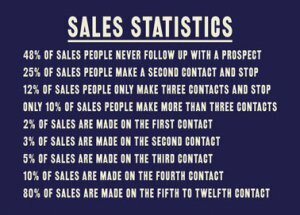 This sales statistics graphic I found, paints a picture of why “follow up” is so important. Nurturing a company or group along the path to booking is an arduous and pain staking journey. Open any one of your sales files and look at the contact log. How many times did it take to get a prospect to sign on the dotted line? Chances it took more than 4 conversations/contacts! Relationships are built on familiarity…. familiarity is based on frequent contact…. frequent contact is the basis for friendship. People buy from people they know and like! You have designed a road map and action steps for both market segments and individual companies. Now is the time to start following those paths. What is going to be your next step…. is it a Halloween greeting? A message of Thanks? A Holiday wish? Have you seen something about your client in the newspaper, on TV or in a Google Alert? Did a special event or occasion remind you of a client’s passion (baseball = World Series; dance = Dancing With The Stars show; hunting = Opening of Hunting Season; book review = New Book Release, etc.)? These are perfect opportunities to reach out to a client and keep up lines of conversation. Are you tired of the same ole’ same ole’ dialing for dollars phone calls? Add some variety to your sales strategies and methods. Change it up. Be creative. Most people in business would agree that promises come cheap, but it is the follow up and actions that really create lasting impressions. In a sales context, the importance of follow up is magnified. And the follow up should be on-going because we want the relationship to last. So let’s look first of all at the benefits and why we need to stay in touch, and then we’ll look at some ways that we can do it that will not only maintain the relationship but will also add value. So, what can be gained? They say that in order to maintain a relationship, opportunities for meaningful contact should occur at least every 90 days. So we are going to have to get creative with how we can achieve this, because we do not want to follow up in ways that make us appear self interested or look like a stalker. We want to create a relationship that is based on trust. In his book “The Speed of Trust” by Stephen M R Covey (the son of “The Seven Habits of Highly Effective People” author) he says, “I submit that while high trust won’t necessarily rescue a poor strategy, low trust will almost always derail a good one”. By implementing good follow up and tactics for staying in touch we can both establish and build on the trust we need to succeed. Part of staying in touch is to maintain our “front of mind” position. We want to be the person or the business that first comes to mind when our clients are thinking of things like organising a corporate rate or a conference…even a night out to celebrate a milestone birthday. In order to do this, we have to make sure that another business does not take that position away from us. Now that we have established some of the reasons it is important to stay in touch, how can we do this in such a way that our clients welcome the contact? As I’ve already said it is important to make sure that these are meaningful connections. I recently met with a client who was Training Manager with Hilton who said that he really enjoyed being contacted by our Business Development Manager Tammie because she was always able to offer something of value from the experience. To make sure your clients feel like this, what can you do? Write a postcard. I recently visited a hotel with the view to organising a venue for a series of training programs. Three days after returning to the office, I received a hand written postcard from the salesperson from one of the hotels I visited, just saying that they hoped I enjoyed my visit to their city and how delighted they would be to stay in touch. This was, of course, on top of the email that was sent within 24 hours of the appointment confirming all the details of our discussion. Send a cultural greeting. This doesn’t need to be just for the standard ones like Christmas. You can also send them to the relevant clients for Chinese New Year or National Days. You can personalise these even further by sending best wishes for sporting events that are of interest to the client and so on. Recommend an article, a book, a website etc that will be of real significance to the client. These could be related to their business or to their personal interests. The important thing is to ensure relevance. Inform your clients of any changes that are happening within your team, your hotel or your company that could be of interest to them – the appointment of a new GM or member of the Sales team; the re-launch of a new restaurant theme; opening of a sister hotel, etc. Keep your eyes peeled for good news stories about your clients and their business (eg better than average profits, the winning of awards, being recognised for community events etc) and contact them to congratulate them. Wish them luck or best wishes. If you know that they are going to be running a race, facing exams as part of their studies, are getting married etc., call them with the sole purpose of letting them know that you are thinking of them and are wishing them well. Wishing “happy birthday” is one of the most personal ways to recognise a client as an individual. And don’t forget the obvious – staying in touch also to see whether the client has any business needs that you can help with. However, if this is the only reason you are in touch, the client will soon realise that your interest in them is purely for what they can do for you and not about the relationship that you have with them as an individual. Ensure you are not predictable about the way you connect – you need to be taken as genuine. We are all very busy these days, but if you don’t reach out to your contacts now and again, you will be quickly forgotten. The key is to make sure that you are not out of contact for so long that the person has to say “can you remind me who you are again?” If that happens, you will have to start over from the beginning and rebuild that relationship. ← Customer Service or Customer Wowing?